Dense snow made a mess of Vermont roadways Tuesday and knocked out power to tens of thousands of residents and businesses. “This is a state-wide event,” observed Joe Flynn, the secretary of the Vermont Agency of Transportation. 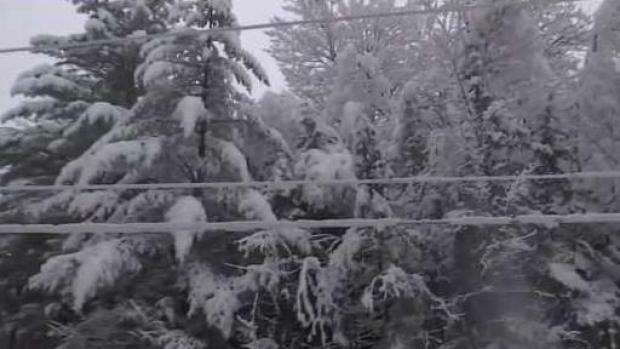 Snow the consistency of mashed potatoes caked trees and sent them crashing into power lines across Vermont Tuesday, leaving the utility Green Mountain Power and others scrambling to restore electricity to people knocked offline. At 4 p.m., more than 36,000 power customers served by various utilities were in the dark across Vermont, according to the website VTOutages.com. Heavy, wet snow caused big headaches for road crews and utilities across Vermont Tuesday. Green Mountain Power said it brought in extra crews to handle the crush of work, and they found a dangerous job in some spots. Among the customers in the dark for part of the day: the statehouse in Montpelier, and the West Dover ski resort Mount Snow. Mount Snow said online it just couldn’t power its lifts at the beginning of the day, but by lunchtime, service was back. The destination was then cheering the more than a foot and a half of fresh snow it tallied by mid-afternoon Tuesday. Snow was forecast to keep falling in the mountains of Vermont until Wednesday, even after it tapered off in the lower-lying areas. In mountainous Duxbury, weighed-down branches were whacking Randy Fisk’s truck as he plowed roads, with heavy snow there making a long day for him. “I like the nice light, fluffy stuff,” Fisk said, smiling, as he moved heavy snow off Scrabble Hill Road. Before Fisk could clear the worst of the snow from the bottom of that road, a car apparently got stuck trying to head uphill. Vermont State Police and the Vermont Agency of Transportation reported numerous slide-offs, including on I-89. The officials were urging drivers to keep their speeds way down, if they had to travel, and pleading with folks to leave extra room on the roads for other cars and for plows. “It’s not just a public safety concern, it’s a personal safety issue,” VTRANS secretary Joe Flynn told necn and NBC 10 Boston. Duxbury resident Marc Castle was trying to keep on top of the accumulation, working his snow blower hard to clear his driveway. 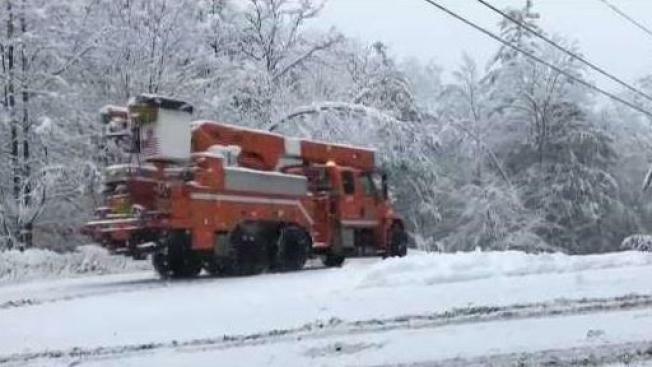 Green Mountain Power warned some customers in particularly remote areas that restoration work could take days, because of a high number of individual outage incidents and the complexity of work in areas with downed trees. At 4:30 p.m. Tuesday, GMP was reporting more than 1,600 outage incidents affecting nearly 120 Vermont towns.